← Inspiration and Writers’ Block: Fact or Fallacy? Dutch Attack on the Medway by Pieter Cornelisz van Soest, painted c. 1667. While most of us are familiar with stories of the Plague (1665) and the Great Fire of London (1666), few are acquainted with the third catastrophe that hit England in 1667. 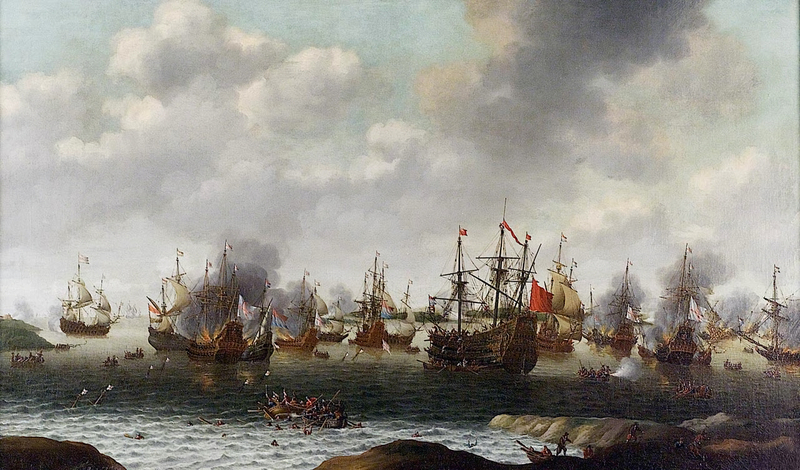 On 9 June, the Dutch fleet led by the renowned Admirable De Ruyter, launched audacious attacks on the Medway and the Thames that threatened to wipe out the royal fleet and bring London to its knees. Having begun in 1665 with a number of English victories, the second Anglo-Dutch war between England and its trading rival Holland ended in a humiliating episode which the diarist John Evelyn described as “a dishonour never to be wiped off”. Being both a courtier and a minor official, Evelyn was well-placed to observe the impact of the Dutch attack that summer. It is clear from his account, that the English were unprepared for the raids. While Parliament had granted the Crown £2.5 million to prosecute the war in 1665, both the plague and the fire of London had had a devastating effect on resources. With much of the City’s financial sector destroyed by fire, it became impossible for the Crown to raise sufficient money to continue an effective campaign. Due to this lack of funds, the fleet was laid up at Chatham providing a sitting target for the Dutch who fell upon it “by a most audacious enterprise … doing us not only disgrace but incredible mischief in burning several of our best Men of War, lying at anchor and moored there”. Evelyn makes it clear that the British response was too little, too late. Despite the despatch of land forces, the fortification of Upnor castle, and the laying of chains and bombs across the Medway, the Dutch managed to break through “and set fire on our ships”. He tells how he saw the smoking carcasses of the warships Royal Oake, James and London just outside Chatham and how “now when the mischief was done, we were making trifling forts on the brink of the river”. But the raid on the Medway was only part of the Dutch attack. Evelyn describes how “triumphantly their [the Dutch] whole fleet, lay within the very mouth of the Thames, all from North-Foreland, Margate, even to the Buoy of the Noore”. Evelyn describes it as: “A dreadful spectacle as ever an English men saw.” His intensity of emotion was probably sharpened by fear for his own possessions. Evelyn’s home, Sayes Court, was located near Deptford and a further incursion up the Thames could have proved disastrous. For this reason, Evelyn “sent away my best goods, plate etc from my house to another place”. Both the county and the city were stricken with “a panic fear and consternation such as I hope I shall never see more: for everybody were flying, none [knew] why or whither”. The Dutch blockade of the Thames also caused other problems. With this vital artery blocked, the city and surrounding area had begun to run out of fuel. The price of coal rose from 15s to 140s a ton. Evelyn, along with a number of other officials, was tasked by King Charles II to search for alternative sources of peat or turf. As part of this project, Evelyn – a founder member of the Royal Society – was invited to explain his recipe for a new type of fuel made from charcoal dust and loam. Although Evelyn claimed that the fuel burned “without smoke or ill smell”, it does not appear to have been put to use on this occasion. While the raid on the Medway was effectively over by 14 June, the blockade of London continued into July. Finally, at the end of the month, the war was brought to an end by the Treaty of Breda. Evelyn was ordered to free the prisoners of war in his charge who had been held at Leeds castle. With obvious relief, he records “peace being now proclaimed according to usual form by the Heralds at Arms”. However, the humiliation suffered by the English did not end there. As if the burning of the ships in the Medway was not enough, the warship Royal Charles had been captured and taken back to Holland where it was exhibited in Amsterdam as a trophy of war. For the price of a few guilders, members of the public were able to climb aboard and explore. It was an insult that added to the injury already inflicted on the British fleet. 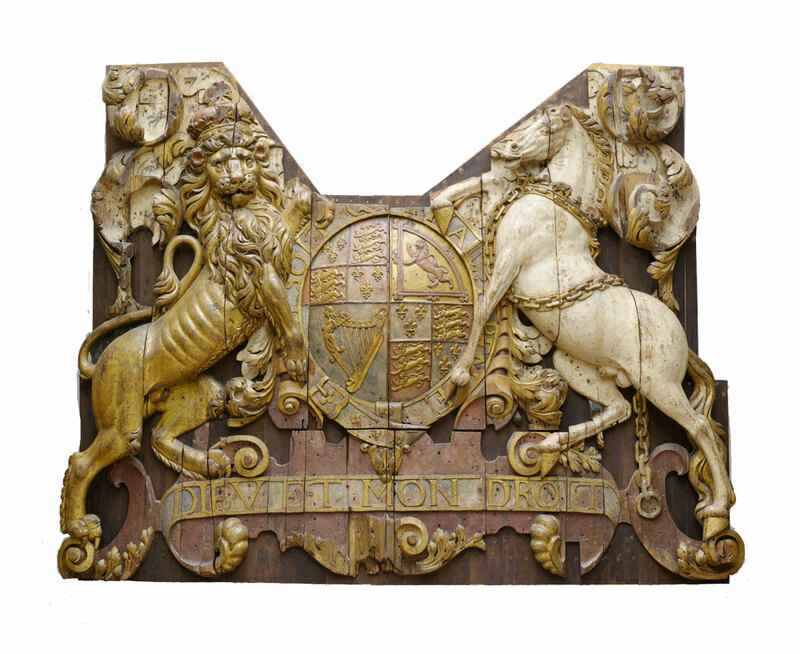 Featuring the royal coat-of-arms supported by a lion and a unicorn, the stern section of the Royal Charles can still be seen in the Rijksmuseum. Of the hat-trick of historical disasters that afflicted England in the mid-17th century, the Dutch raid on the Medway is – not surprisingly – the least well-known. While the first two were Acts of God, the last was man-made and largely self-inflicted. This entry was posted in Charles II, History, John Evelyn, Kent, Medway, Raid on the Medway, Thames, Travel and tagged 1667, Anglo-Dutch wars, Dutch raid, John Evelyn, King Charles II, Medway, Rochester, Upnor Castle. Bookmark the permalink.